Probably what I miss most about being a bookseller is the chance to introduce readers to writers they don’t know, and might love. This Spotlight on … series is my way of remedying that. And because my passion for all things speculative fiction extends to film and tv too it’s not just books I’ll be recommending. So welcome to the first of my Spotlight on … raves. Oddly enough, now that I come to think of it I can’t remember exactly when or how or why it was that I came across the late Kage Baker’s science fiction series, The Company. But I am so pleased I did. Kage Baker was born in 1952 and died in 2010. While she lived she wrote short stories, novellas and novels in the genres of science fiction and fantasy. Her work was nominated for Nebula, World Fantasy, Theodore Sturgeon and Hugo Awards, and in 2009 The Women of Nell Gwynne’s won the Nebula for Best Novella – but for me she remains one of the most criminally under-rated and under-praised writers in speculative fiction. I’m going to focus this spotlight on the first two books in this amazingly original and inventive time travel series: In the Garden of Iden and Sky Coyote. Before taking the leap to being a full time professional writer, Baker spent a lot of time in the theatre and taught Elizabethan English as a second language. Her love of history and language, and her depth of understanding and knowledge in both, infuse her work with effervescence, wit and humanity in all its many hues. In the 24th century, a shadowy corporation led by the mysterious Dr Zeus develops the ability to time travel and uses it to send its operatives back in time to acquire important artifacts, objects of interest, items that will in the future become rare, to protect certain species from extinction and observe important historical events. It’s an uneasy mix of ruthless greed and benevolent altruism and the entire process depends upon the The Company’s agents – unwanted human beings plucked out of their own time, radically modified, then deployed on assignment throughout human history. 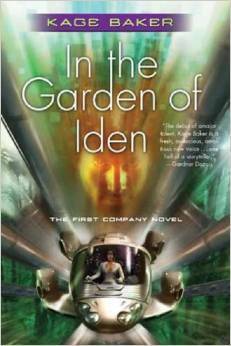 In the Garden of Iden introduces us to agent Mendoza, who is assigned to a mission in Renaissance England. Once a victim of the ruthless Inquisition, now she’s a botanist on a mission to save an endangered species of holly. But Mendoza’s life is turned upside down and inside out when she meets the dazzling Master Nicholas Harpole. To be a Company agent is to live out of time, to be forever an observer and never a participant in the world of the mission. Until now, Mendoza has had no problem living the Company line – but this time she finds herself drawn both to Master Nicholas, the man, and to his dangerous defiance of royal and church decree. For Bloody Mary is on the throne of England and to defy Catholicism means courting death. Mendoza is an astonishingly vivid character. Prickly and blindly passionate, she’s not always easy to like, but I fell in love with her anyway. Her view of the world is forthright. She finds compromise a challenge. She’s sometimes cold, sometimes heartbreakingly vulnerable, always striving to do what’s right. She feels injustice keenly and hates all forms of cruelty. For me, she’s one of the best characters ever written in the science fiction genre. But Joseph, her supervisor, gives Mendoza a run for her money. Older than Mendoza, amusingly cynical, wearily kind, Joseph always does his best to save Mendoza from herself. While In the Garden of Iden is her story, Joseph is a vivid part of it – and it was with great delight that I discovered he was the hero of the next Company book, Sky Coyote. 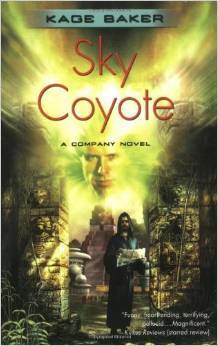 Sky Coyote takes place in 1699, where Joseph is tasked with the daunting mission of saving the Mayan Chumash people from impending annihilation. In his time Joseph has sailed with the Phoenicians, served as a priest in Egypt and as secretary to a Roman senator. He’s wily and experienced and no easy pushover – but his skills and ingenuity are tested to their limits as he tries to convince the Chumash people that they really are in danger. This second book in the series also drops more hints about the mysterious Company and Dr Zeus, while introducing a few more important characters and letting us know how Mendoza is faring after the dramatic events in Renaissance England. The single most astonishing thing about Sky Coyote is how it demonstrates Kage Baker’s mastery of storytelling and voice. The first book is pure Mendoza. The second is pure Joseph, and never could a reader confuse the two. As a writer I was not only vastly entertained by these books, I was keenly educated too, and I have gone on to read the entire series with gusto. There is no science fiction series remotely like it. Though tragically Kage Baker has left us, the legacy of her fabulous work remains. You can order her Company books online or at the bookshop of your choice – please check my Where to Buy page for suggestions – and if you do, I’m pretty sure you’ll not be disappointed. In fact, I think there’s a good chance you’ll do what I did – buy myself a copy of every published instance of her work. The world is a sadder place because she’s no longer writing in it – while, at the same time, infinitely better because she wrote in it at all. For more information about Kage Baker you can visit her website. This entry was posted in Reviews and tagged Spotlight by Karen Miller. Bookmark the permalink.